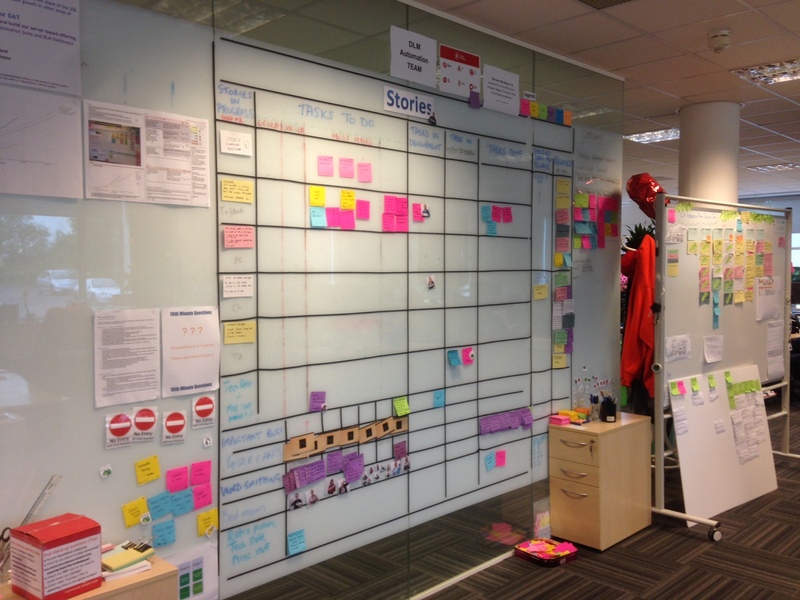 Redgate‘s whiteboard culture takes visual management to a new level. Last week, when visiting the UK, I spent two days in Cambridge co-working with Business of Software‘s Mark Littlewood and team who share space with Redgate. 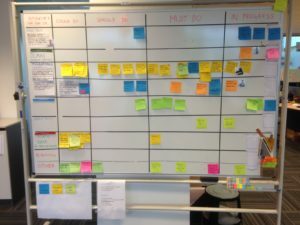 Everywhere you look there’s a whiteboard filled with sticky notes, printouts and handwritten index cards with lines and labels drawn in colored tape and marker. Most agile teams apply this practice. Following the mantra of “Make it Visible,” we seek to publish our ideas and document our process with artifacts that facilitate communication. The agile practice of software creation has its roots in Toyota’s just-in-time production system where Kanban boards were first developed back in the 1940s. Mark Wightman gave me a tour through their vibrant, open offices, providing an unexpected glimpse into their culture. 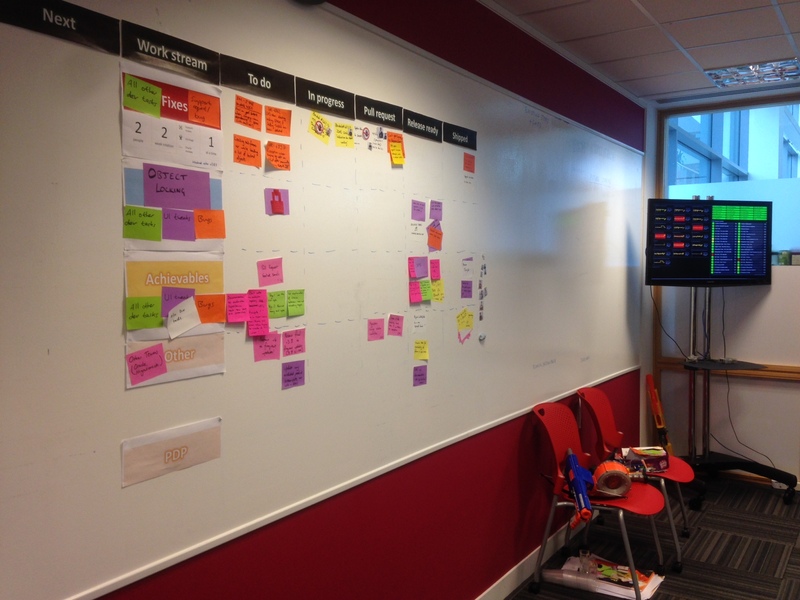 At first glance these displays at Redgate looked familiar, but these boards were not just a nimble construction of team process, they were an expression of team values and identity. From my perspective as an outsider, they were tangible evidence of a culture that embraced individual creativity and independence, alongside knowledge sharing and cross-team alignment. It’s a hard balance to strike. As companies scale, processes need to be standardized for people and systems to interoperate. It’s impractical manage a business when everyone is doing their own thing. Customer quotes appear in speech bubbles along the top and bottom of the whitebaord, printouts show metrics and other reports, along with classic story cards arrayed kanban-style. Redgate has some standardized reports: a one-pager that every team provides up the management chain, but the CEO also does whiteboard tours, visiting a few teams every week to see what they are working on and talk through their latest accomplishments and challenges with the help of these artifacts on their walls. The standard parts of the report help the management team act quickly on information needed to run the business, and these dynamic, diverse expressions make it so new ideas and new challenges can be seen quickly. Humans process huge amounts of information quickly and we are amazing pattern detection engines. When I remarked at how the Redgate culture clearly valued individual creativity, Marked reframed this the way that they achieved continuous improvement. For teams to adapt to change, variation must not just be allowed, it must be celebrated. 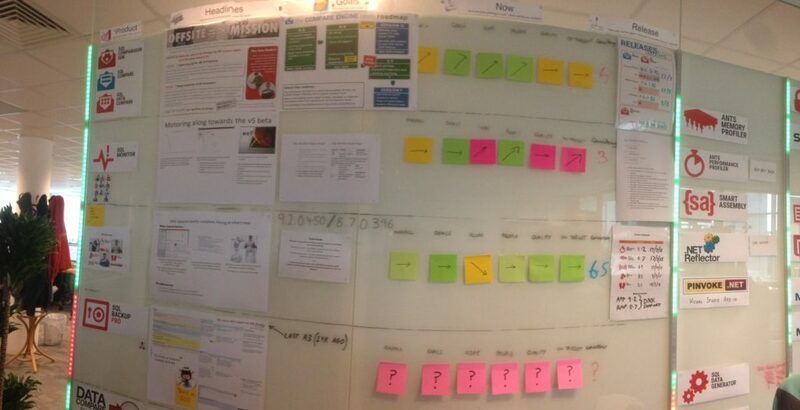 Vertical strips of lights show status of builds and tests from a continuous integration system. Each team updates “headlines” weekly, using that space to introduce new team members and include success stories along with whimsical imagery. Colored sticky notes and arrows provide a quick short-hand status update. On the flight back to SFO, I caught up on some 18F work and appreciated our virtual tools of github, waffle, slack and google docs that make it possible to work remotely in the UK or at 35,000 feet with full access to all of our team processes and artifacts. 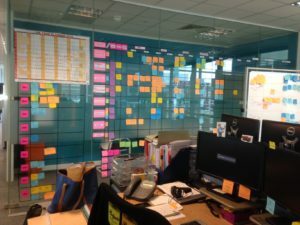 Yet these colorful images of whiteboards, printouts and sticky notes keep replaying through my mind’s eye and I wonder if there is some way to capture that vibrant and flexible communication in our virtual world of work. Many thanks to Redgate who let me experience their world for a just a little while. Note: if you want to work like this, I noticed that they are hiring in Cambridge, UK and Pasadena, USA). Nice pics and writeup, Sarah, thanks. It sounds like you’d prefer the stickies and white boards if not for the needs of remote team members — either permanent or only temporarily at 35,000 feet. Maybe I should consider trying that again. 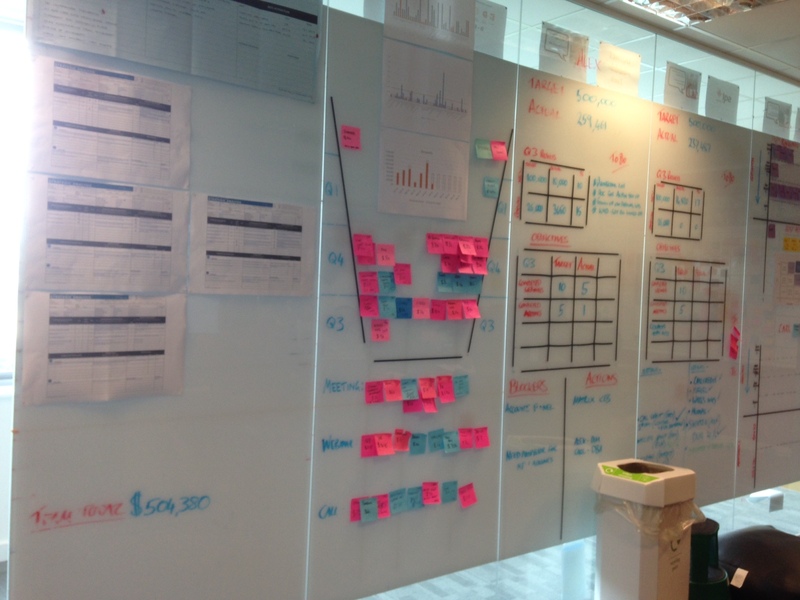 I have to say it’s hard to imagine executives doing a casual walkthrough discussion with a team in front of a waffle.io or Jira project board, but that seems possible and much less scary in front of a wall full of post-its. I wonder why? Yes, there’s something that is less accessible about trello or waffle — too much reading, not enough visual variety and no ability to add free form arrows or annotations to draw attention to things. 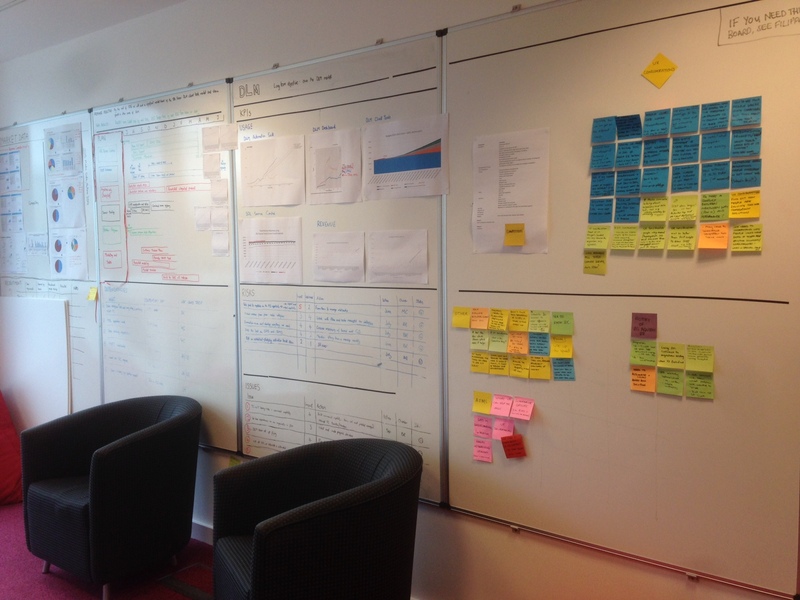 With the Redgate whiteboards almost every one had additional project information in the same space. I actually had a thought about putting waffle in an iframe and adding space for quotes or metrics, though our screens are still quite small relative to the size of a whiteboard.